The Midnitelite Skid Mobile Lighting Tower provides a powerful, safe and effective solution for even the toughest industrial and mining lighting challenges. The Midnitelite Skid range of lighting towers was developed in response to requests from our clients for a heavy-duty and user-friendly skid mounted lighting solution. Based on the existing design and ethos of the Metrolite, the Midnitelite skid lighting towers offers a more robust solution and is particularly well suited to mine sites and harsh environments. The sturdy design and heavy-duty skid base allow the Midnitelite lighting tower to be transported across rugged terrain and installed in the most demanding conditions. Midnitelite lighting towers endure the most severe on-site treatment and deliver continuous bright light safely and reliably — even in the toughest conditions. Midnitelites are designed to be entirely versatile, manoeuvrable, and user-friendly. Each light requires only a single operator, which means you can focus your workforce, where they are really needed. Skid-mounted for stability: The robust, heavy-duty skid base provides an exceptional stability even on the most rugged terrain. 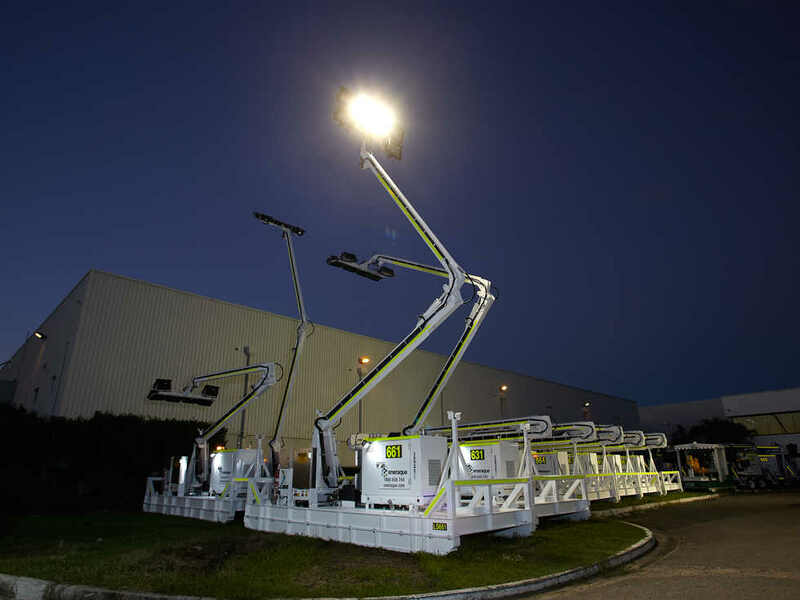 Brilliant light when and where you need it: Hydraulic, fail-safe, 9m, 10.5 to 13m with options to extend from 18m to 24m. 340-degree slew with Automatic lock, double-jointed, knuckle-style mast supports and direct lights*. Ideal for high wall overhang applications. Ideal for use in harsh conditions. 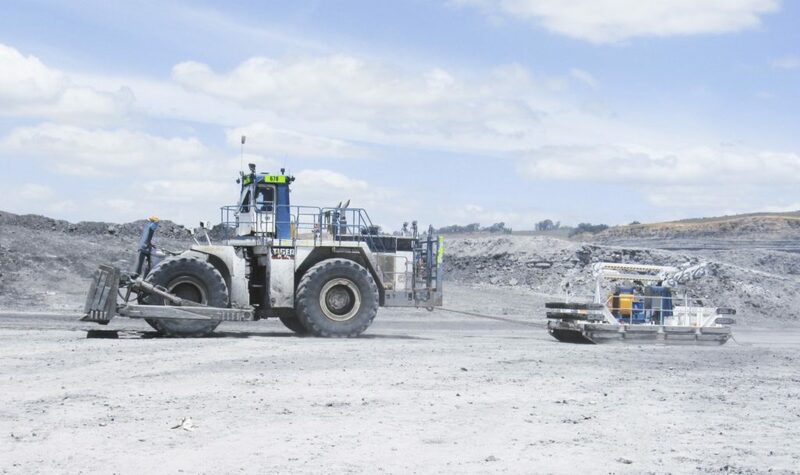 Its rigid, strong and durable skid with push bars, towing points and chains make it an easily to tow into position with heavy-duty mining equipment. Brilliant light for your site: Light output that ranges from (but not limited to) 420,000 to 3,200,000 lumens. User-friendly and labour efficient: requires only a single operator and produces a brilliant spread of light. SS – Standard Skid – suitable for standard open cut mining applications – 500mm base frame with 125mm push bar and built in fully bunded fuel tank, 350˚ slew. MS – Mega Skid – large base with fully turnable for lighting boom. Extensive timber buffers mounted to push bars up to 1500mm from ground height. push bars to back and front of skid, 350° slew. SuS – Super Skid – large 10m in length with full 270 Degree slew mast, hydraulic legs with timber buffers mounted to push bars up to 1500mm in height. Push bars front and back of skid. The design of the skid ensures it can be placed next to a high wall and be operated from the far side. This ensures all site safety and occupational hazards are eliminated. Our flexible approach means that if you can’t find the right lighting tower for your application in our standard range, we’ll custom-build one for you. View our full range of Lighting Towers available from our MegaLED, Metrolite and Midnitelite series, or see the latest in our Latest News. Click Here to contact the Eneraque skid lighting tower experts today or call us on 1800 636 744.